« Was Paul an Apocalyptic Jew Before His Conversion? It has been a trying couple of weeks for Saudi Arabia. First, a tweet from an account associated with the Saudi government appeared to threaten Canada with a 9/11-style attack if they continued to “stick their nose where it doesn’t belong.” . . . . .
And then, not long afterwards, the Saudi government beheaded and crucified on a public pole a Burmese man found guilty of murder. . . . . .
Then, on August 9, a Saudi jet targeted and destroyed a school bus full of children in Yemen. . . . . .
How does one manage the “optics” for a country that behaves this way? First, you need to recruit as many public relations men and lobbyists as possible. This is exactly what Saudi Arabia has done . . . . . hiring some of the best PR and government relations firms in Washington and London. These firms know how to mold public opinion. They are heirs to the father of the dark art of “public relations,” Edward Bernays . . . . . Which brings us to how the United States in particular became the world’s leading practitioner of propaganda. Contrary to common assumptions, propaganda plays an important role — and certainly a more covert and sophisticated role — in tech­nologically advanced democratic societies, where the maintenance of the existing power and privileges are vulnerable to popular opinion. In contrast, under authoritarian regimes power and privilege are not open and vulnerable to dissenting public opinion. A more anodyne term for propaganda is “business and corporate public relations”. 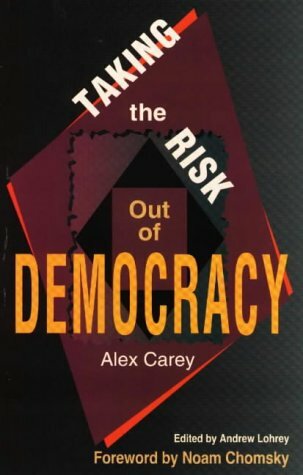 One area of social science that is ordinarily assumed to be useful to a total­itarian regime is research on social and political attitudes … Ironically, psychology and the other social sciences have been employed least in the Soviet Union for precisely those purposes for which Americans popularly think psychology would be used in a totalitarian state political propa­ganda and the control of human behaviour. The modern world is busy developing a corps of men who do nothing but study the ways and means of changing minds or binding minds to their convictions. Propaganda … is developing its practitioners, its teachers and its theories. It is to be expected that governments will rely increasingly upon the professional propagandists for advice and aid. We could agree with Professor Harwood Childs when he contends that ‘Americans are the most propagandised people of any nation’ (Meier 1950:162). Commercial advertising and public relations are the forms of propaganda activity common to a democracy. In the United States over a very long time now these methods have been honed by incomparably more skill and research than in any other country. In the 1940s Drew Dudley, then chief of the Media Programming Division of the Office of War Mobilization and Reconversion, not only observed with satisfaction that ‘advertising is peculiarly American’, but added on a note of (perhaps rather less well founded) pride that ‘Hitler … employ[ed] the technique of advertising during the pre-war and war years, frequently referring to America’s advertising in glowing and admiring terms in Mein Kampf, and later utilising advertising’s powerful repetitive force to the utmost’ (Dudley 1947:106, 108). United States pre-eminence in the means of communication through which to disseminate propaganda — the scale and reach of the mass media from TV, radio and films to comic strips, nationally and internationally — has long been beyond serious challenge. However, it is the fourth condition, the creation and maintenance of emotionally ‘significant symbols’, that has given propaganda its extraordinary power and particular role in American culture. American history has produced a society whose general world view has regularly been described as “Manichean”. It is widely understood, I believe, that one identifying attribute of American culture is its dualistic thinking, its propensity to divide the world into good and evil, the sacred and satanic, and the tools of this thought are the symbols associated with each side. Another widely recognized characteristic of American culture is pragmatism, the preference for action over reflection. Manicheanism and pragmatism go hand in glove. The former facilitates the latter. No pausing to debate the ambiguities, the mix of both good and evil in events or others. A predisposition to symbols and visions of good and evil is fertile soil for propagandists. To put it crudely, playing with simplistic symbols and visions makes it easy to manipulate such a population. The surprising religiosity of Americans likewise plays into the propagandists’ hands, although I would see that as an adjunct to Manichean perspectives. The Manichean dichotomy that has been most powerful — as a means of social control — in respect of both domestic issues and foreign policy issues is not God/Heaven versus Devil/Hell but the secular equivalent of these. Thus on the one hand an extravagant idealization of the Spirit of America, the Purpose of America, the Meaning of America, the American Way of Life — the transcendent values by which the United States is represented to the world as the Manifest Destiny of the world in Piety and Virtue (see Morgenthau 1960). On the other hand the extravagant negative idealization of Evil secularized in communism/socialism as sui generis, in all places and at all times, malevolent, evil, oppressive, deceitful and destructive of all civilized and humane values. The most cursory acquaintance with American political propaganda will suggest that the psychological power of almost all such propaganda derives from a calculated exacerbation of American national sentiments. Notions like the American Way of Life, the Meaning of America, the Spirit of America, become symbols with the irrational power of the Sacred, and from an equally calculated exacerbation of American apprehension about the ‘alien ideology’ of communism and all its allegedly un-American characteristics, communism/ socialism, etc., become symbols of the Satanic. So long as these symbol-identifications can be maintained in popular sentiment it is a simple matter to curb popular demand and support for significant reform of the institutions and conditions of American society. By associating welfare provisions and other (selected) government interventions with Socialism/Communism and conversely the Free Enterprise System with Loyalty, Patriotism, Freedom, the American Dream, the American Way of Life, propagandists are doing no more than manipulating appropriate Satanic and Sacred symbols. It is interesting, instructive even, to compare what Alex Carey wrote about the “medieval” character of America’s erstwhile fear of communism with today’s fear of Islam, and what else… immigrants? refugees? Russia? Arabs? In the sixteenth century witches were regarded as possessed by (that is, as obedient to remote and magical control by) the Devil. In 1955 a reputable American journal that catered to intellectuals editorialized: ‘that [Ho Chi Minh] is our enemy is obvious. He belongs to that particularly dangerous species of men whose nervous system has been rewired to make it obedient to remote control from Moscow’ (‘Who-What-Why’ 1955:8). Carey, Alex. 1997. “The Origins of American Propaganda.” In Taking the Risk out of Democracy : Corporate Propaganda versus Freedom and Liberty, 11–17. Champaign, Ill.: University of Illinois Press. Horton, Michael. 2018. “Saudis Spinning the Optics of Dead Schoolchildren.” The American Conservative. August 14, 2018. https://www.theamericanconservative.com/articles/our-really-huge-and-really-deep-complicity-with-saudis/. Posted on 2018-08-15 01:00:50 GMT+0000 by Neil Godfrey. This entry was posted in Uncategorized and tagged Propaganda. Bookmark the permalink. I watched two interesting old movies a few days ago, “War Nurse” (1930) and its remake “Cry Havoc” (1943). The first one was made just after “All Quiet On The Western Front” came out. It showed the horrible conditions that volunteer nurses had to work under during World War I – surrounded by sickness, blood and death, constant danger from bombs, lack of sleep, and conflicts between love and duty preventing normal romantic and family developments. The movie blamed war for these horrible conditions. If the stupid war only ended, the world would be made whole again. In the 1943 remake the same conditions and the same problems were shown. Only the nurses blamed the war and its conditions on the inhuman and barbaric Japanese. A nurse, in a beautiful speech, encourages her comrades saying that things are really very simple. She says that no matter how bad things seem, we have continue to put up with anything because if we lose we’ll all be dead, and we’ll be the lucky ones because those who live will be slaves. Both movies show the bravery, courage and self-sacrifice of the nurses. The first is anti-war in general, the second is anti-war, but more anti-Japanese. By raising Saudi Arabia, 911, the US and propaganda in the same post you will get a reaction from many. When we saw the planes hit the buildings Tuesday morning 11/9/2001 as screened on Australian TV, one of the adjoining clips was of (supposedly) Palestinian children dancing in the streets celebrating the attack and deaths of Americans. I understand that later that clip was exposed as a fraud, having been copied from much earlier footage than that date. You can see where this is going. The movie I recommend to stimulate thought is Dylan Avery’s “Loose Change” finalised in 2007. Talk about the biggest propaganda fraud since the Bible ! 911 has to be miles ahead of Pearl Harbour, JFK and the Bay of Tonkin. Always ask quid bono ? (who benefits ?) and we find like Neil and Jay’s posts, that the richest either get richer, secure their stronghold or suppress competition i.e. by demonising Islam, the Middle East is further destabilised and weakened and Israel further protected. And how about the weapons of mass destruction propaganda by Bush and Blair on the back of 911 ? The American people were lied to, as was the rest of the world, and Iraq was conquered. I have a lot to say on this, and also in relation to how Germany was demonised for WW2, like the Jews were demonised for crucifying Jesus. Untangling the history is so important when you live in a world that has been brainwashed by propaganda. Of course I am not a holocaust denier, I’m just making the point that psychopaths like Hitler and Sadaam Hussein were enraged for a reason. We lose the plot and misunderstand what our historical record has been about when we demonise the other. I recall outrage over a movie some years back that was said to do the unforgiveable: it humanized Hitler. I thought being and understanding what it means to be human was what reality was about.